Both exhibitions have free admission and show complementary aspects of her work. Cameron first exhibited her prints at The South Kensington Museum (now known as the Victoria & Albert Museum) in 1865, and the V&A owns a large collection of her work as well as her correspondence with founding director Henry Cole. 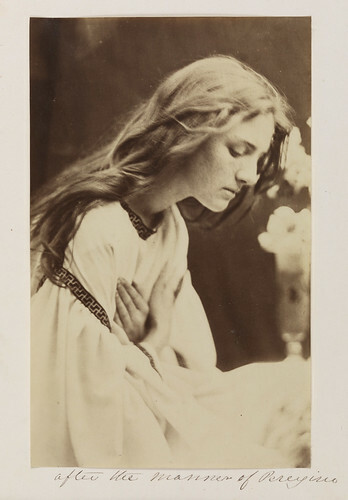 Top: Julia Margaret Cameron, Whisper of the Muse, 1865. 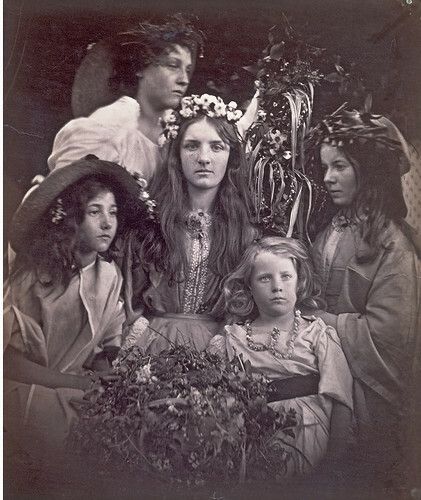 Julia Margaret Cameron, May Day, 1866. © Victoria and Albert Museum, London. 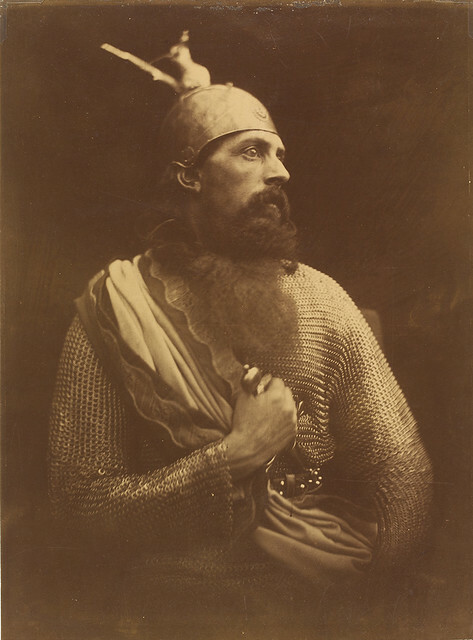 Julia Margaret Cameron, The Passing of Arthur, From Illustrations to Tennyson’s Idylls of the King, and Other Poems, Volume II, 1875. © Victoria and Albert Museum, London. At the Science Museum, on the other side of Exhibition Road, is a second exhibition of Cameron’s work afrom the Herschel Album (1864). This volume is of particular significance since it comprises work given by Cameron to John Herschel, British astronomer. It was Herschel who first introduced Cameron to the medium of photography, during her recovery from an illness. She went on to become a pioneer of the medium, with the ambition of elevating its status that of art. Cameron’s photographs are dark and grainy, the subjects often slightly blurry and out of focus, yet the beauty and charm of each photograph shines through. 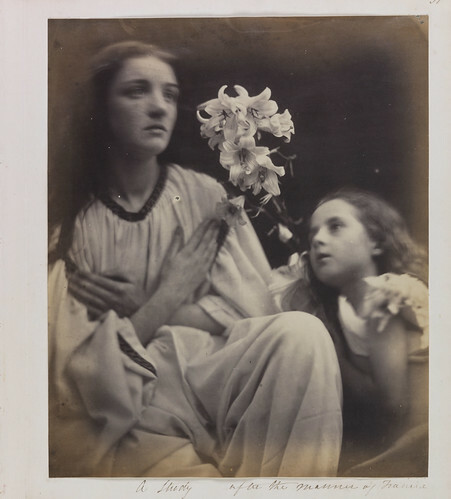 Julia Margaret Cameron began her photographic career when she was 48 years old, and within a year of picking up a camera, she was granted membership with the Photographic Societies of London and Scotland. Despite criticism for her signature ‘soft-focus’ style in which she intentionally blurred the subjects of her photographs, many of her pictures often bore signs of the labour intensive methods of creating them — scratches and marks are still visible on the portraits. 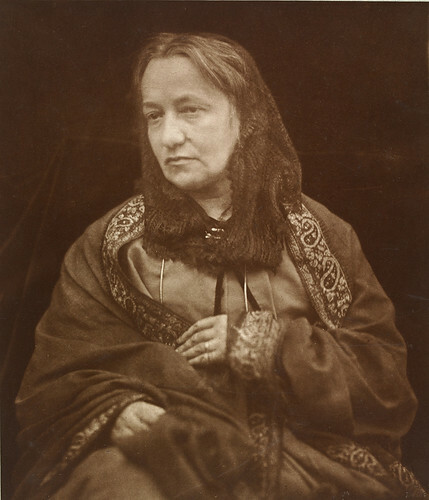 Portrait of Julia Margaret Cameron by Henry Herschel Hay Cameron, 1870. © Victoria and Albert Museum. 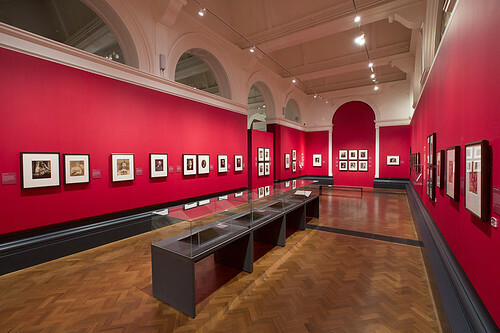 Installation image of ‘Julia Margaret Cameron’, Victoria and Albert Museum, 2015. Victorian photography was not an easy task. For the wet collodion process, the photographer coated a glass plate with chemicals which would be exposed in the camera while still wet. The negative was then developed, washed and varnished. To make prints Cameron placed the negative directly onto photographic paper and exposed it to sunlight. Having spent much of her life overseas with the East India Company, Cameron and her husband retired to London where they were introduced to many of her subjects through her sister Sarah Prinsep, who cultivated a creative community at Little Holland House. 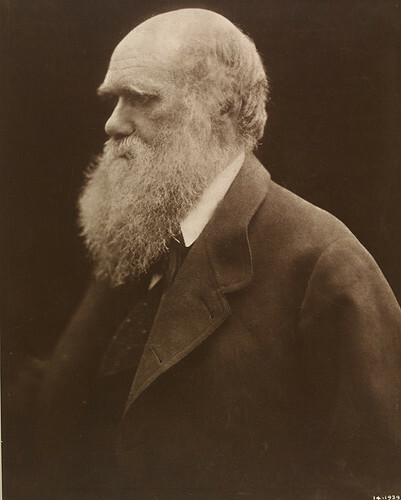 Cameron made portraits of many famous people of her day, including Charles Darwin, Robert Browning, John Everett Millais, William Michael Rossetti, Edward Burne-Jones, Ellen Terry, George Frederic Watts and Alfred Lord Tennyson. Julia Margaret Cameron, After the Manner of Perugino, 1865. © National Media Museum, Bradford. On display at the Science Museum. 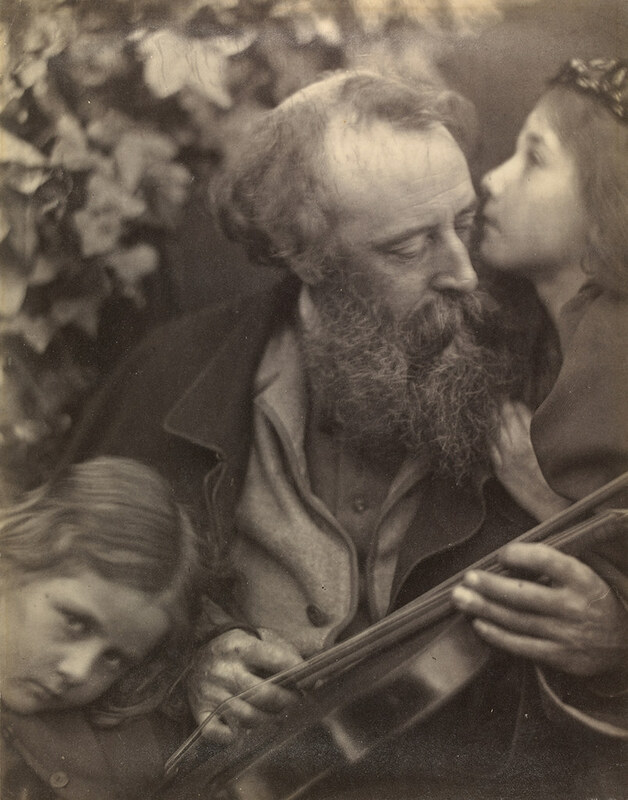 ‘Julia Margaret Cameron’ at the V&A is on display until 21 February 2016 and ‘Julia Margaret Cameron: Influence and Intimacy’ at the Science Museum continues until 28 March 2016. Accompanying the V&A exhibition is a feature that enables visitors to photograph themselves and friends using a ‘Victorian filter’. To see examples of ‘Victorian selfies’, enter the hashtag #VictorianMe on social media. 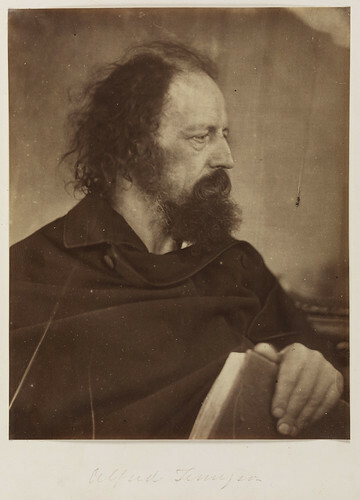 Julia Margaret Cameron, Alfred Tennyson with book, May 1865. © National Media Museum, Bradford. On display at the Science Museum. Julia Margaret Cameron, A Study after the Manner of Francia, 1865. © National Media Museum, Bradford. On display at the Science Museum.